One of the matters arising from the court sitting in the Federal High Court, Abuja presided over by Hon. Justice Binta Nyako on March 1, 2017 hearing of the case of 11 count charges bothering on treasonable felony and other frivolous charges instituted by Nigeria government against Mazi Nnamdi Kanu and three (3) other defendants is the outright denial of Nnamdi Kanu (1st Defendant) the chance to speak as he demanded to say something during the court sitting. 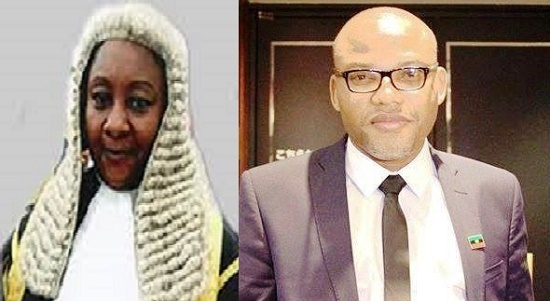 In fact, the trial Judge, Hon Justice Binta Nyako furiously threatened to take drastic action against Nnamdi Kanu by designating him as "unruly" who will not be attending court sittings any more should he speak further that day in the court when Mazi Nnamdi Kanu was seriously praying the court for a chance to speak. (1) Any time the trial judge make a special demand to hear from the accused person on a matter which may elude the defense lawyers as they are mere defense counsel who is not the exact accused person probably during cross-examinations. (2) Any time on a request from the Lordship (presiding Judge), the accused person want to make a special comment or give his testimony as a way of making authentic his denial of the accusation levelled against him or her. It is always prerogative of the accused person to be heard by the court whenever he make demand to speak, as nobody know what he may wish to tell the court. The world is a witness to the fact that Mazi Nnamdi Kanu has always kept quiet in the court room even as he has been subjected to all manner of judicial caricature, verdict somersault and all round judicial rascality by both Justices John Tsoho and Binta Nyako. It was only when the judicial caricature reached a crescendo as Justice Nyako ruled in favour of the laughable eventually failed secret trial and mask witness on December 13, 2016, that for the first time Nnamdi Kanu made an unprecedented reaction in the court and rejected the laughable secret trial. Why then should this same accused person who has continued to maintain orderliness in the court be outrightly denied of his prerogative to speak in the court at his demand? Does Justice Binta Nyako actually understand the judicial procedure which stipulates that a person enjoys the mercy or pity of the court until justice takes its full course on any trial, which will always make the court to allow the accused person to speak at his demand? I want Justice Binta Nyako to understand that it is upon the basis of this mercy or pity of the court enjoyable by the accused person, that ECOWAS court is continuously waiting on Nigeria government to provide enough reason why Nnamdi Kanu should be kept in detention. I strongly believe that the mercy and pity of ECOWAS court enjoyable by Nigeria government as the accused person will end come April 27, 2017 when justice will take its full course on the case in ECOWAS court. It is upon the denial of judicial prerogative of Nnamdi Kanu to speak in court when he prayed her Lordship that I described the action of the trial Judge as a human right abuse inside Nigeria Federal High Court supervised by Justice Binta Nyako herself. If there is any cogent reason why an accused must be denied his right to be heard in the court in a given court sitting, most probably due to time constrain, the trial Judge must show respect or humility before the accused when telling him or her to wait for the next court sitting and not by threatening and at same time, designating the accused person as "unruly". Whereas, the continuous disobedience of court orders and assaults on journalists at court entrance by the DSS officers have never been designated as "unruly" by the court. This action by Justice Binta Nyako is tantamount to judicial rascality and human right abuse meted on the accused person and she must purge herself of that judicial high-handedness against Nnamdi Kanu who should rather be enjoying court mercy and pity until justice is rightly administered. Justice Binta Nyako must apologize to Nnamdi Kanu for threatening him with powers vested on the court as if it is her personal property or she remains guilty as a human right violator.